So simple. A wide, stiffly woven ribbon held up by some poles, the kind you’ll find in packages of blank CD’s. The ribbon is meandering through space, making hair-pin curves and casting lovely shadows. In reality it’s merely lovely. In the drawing (the poles are omitted) the ribbon becomes animated, mysterious and sur-real. Here’s another angle. You can draw right now, from this image on your screen. We started class with this exercise. Drawing by Maggy Shell, charcoal, ~ 14” x 18”. 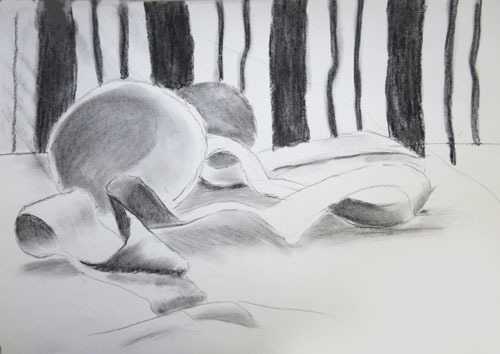 Draw a portion of the still life so that your drawing will have a definite shape on the page. That was the assignment. I brought in large textured paper, 30” x 22”, and encouraged everyone to work in charcoal or very soft graphite. Notice that the pot in reality is big. Does it have to be drawn big? No. The pot and the drapery should be drawn in such a way that they sit nicely on the page. 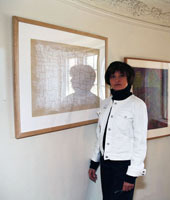 The artist adjusted the size of the pot so that it becomes part of the arc of the composition. The arc could have been drawn as if floating in space, but the artist suggests some terra firma by putting in a line to indicate a table top. Notice that the table top line is broken behind the pot. Cézanne plays this game in his paintings all the time. We’re not committed to documenting reality. The goal is to create a lively page. At a distance you see an engrossing painting in muted complimentary colors, blues and orange-browns. If you move close to this canvas you’ll see that things are glued onto it. At (2) there’s a distressed black rectangle with a yellow band at the bottom that has a zig-zag line on it. 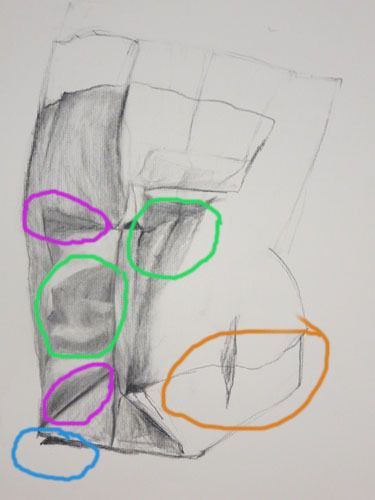 At (3) the artist painted a continuation of (2). At (1) we find a rich brown patch that is actually a piece of sand paper. At (4), some pieces of cloth and frayed canvas. The realization that these banal objects on the canvas [(2) is some rubber that was found on the street] are used so harmoniously in the painting is thrilling to any modernist. This juxtaposition of aesthetics and the mundane marks modernism. Before 1912 painters did not glue anything onto their drawings or paintings. That summer in 1912, however, Georges Braque saw some fake wood grain wall paper in a store window, bought a roll and pasted strips of it into his charcoal drawings. The audacity! You call that art!? Art was expected to emanate from some higher power and remind us of lofty ideals to live up to. Now this! Even Picasso was shocked. But he immediately understood that collage was another way to subvert the ideals of the Renaissance and so, of course, he was all for it. Thus we have the beginning of Synthetic Cubism, which gave us a new way of staying alert when looking at art and life. Thank you, Braque! That antique patinaed pitcher looked quite commanding at the pinnacle of the still-life heap. You would think it would become the star of the show. But its majesty had to contend with a pile of stripes. Just some striped cloth, you might think, so humble and folksy. Haha, not so. Stripes are powerful and will command your attention. The grand pitcher had found its match. The drawing is not about any one object. It’s about how these strong forms hang together in a composition that sits well on the page and, yes, holds your attention. What the artist saw was a ball and a ribbon. 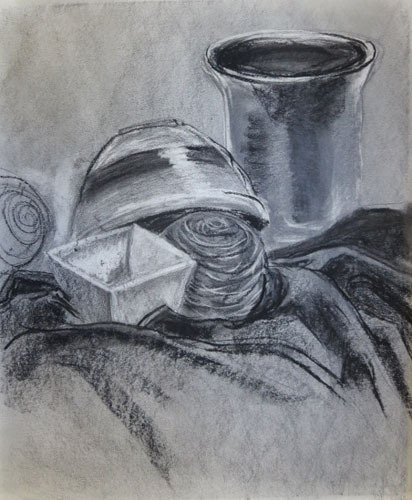 A ball and a ribbon can make an interesting drawing, but the challenge with a still life like that is inevitably the “background.” There’s no such thing as “background.” That’s a modernist credo and I uphold it. In the modernist sensibility, every square inch of the painting or drawing has to hold the viewer’s interest. What to do? You invent. Maggy Shell invented the stripes. She could have invented a wall paper of polka dots or hibiscus with hummingbirds. Why are stripes a good, possibly the best, choice? Because the stripes present a variation on the ribbon motif which is the largest part of the still life. What we get, therefore, is a theme-and-variation–always engaging, in whatever art form we find it: music, poetry, storytelling, painting, drawing, sculpture. This invention takes the drawing out of the category “illustration” and makes it art. Drawing by Maggy Shell, charcoal, ~14 x 18. Another admirable drawing by Barbara Heaton. Here she prepared the paper as before (https://artamaze.wordpress.com/2015/02/15) but this time she mixed charcoal and graphite. 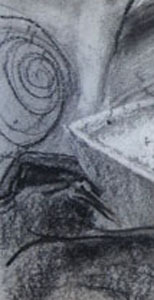 At a distance this mixture reads well enough, but close up or viewed at certain angles, the graphite is shiny while the charcoal is dense and black. That’s what the camera picks up, too. You can see that the drapery is done in charcoal and the tall vase in graphite, an undesirable effect, I think. The spiral on the left, like the one in the middle of the drawing, suggests a ball made of twine, but this one is drawn like a spiral without any three-dimensional shading. You can think of it as unfinished or you can think of it as suggesting a whole other way of seeing. The other way becomes more apparent when you crop, one of my favorite visual games. Go to the grocery store. Come home, unload the paper bag on the kitchen counter and put your stuff into the fridge and pantry. There’s the bag. Crumple it up some more. Find it irresistible. Contemplate. Sit down with your drawing board, paper and pencil (charcoal or whatever you like) and draw it. Lose track of time. Forget about food. Yesterday was the beginning of a new semester. 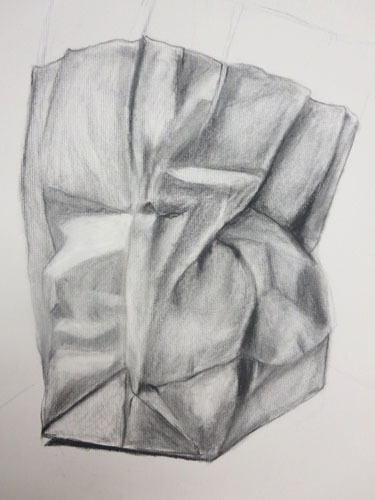 In my drawing class I set up crumpled brown paper bags to be drawn. Some still life. Very still, indeed. A brown paper bag doesn’t look like much. It’s too common, banal, too every-day. But when you draw it, it can become monumental. 3. The drawing should be done with a soft medium that offers the possibility of going truly black, so that that the drawing as a whole will be quite dense. Use charcoal, china marker or very soft graphite. 4. The overall shape of the composition will be a rectangle, wobbly and nicked, but still rectangular. The dense, faceted rectangle will sit like a monument on the page. Her drawing follows all the tips I offered during my demo, except the last one about leaving some part unfinished. Let’s look at that possibility in the next post.